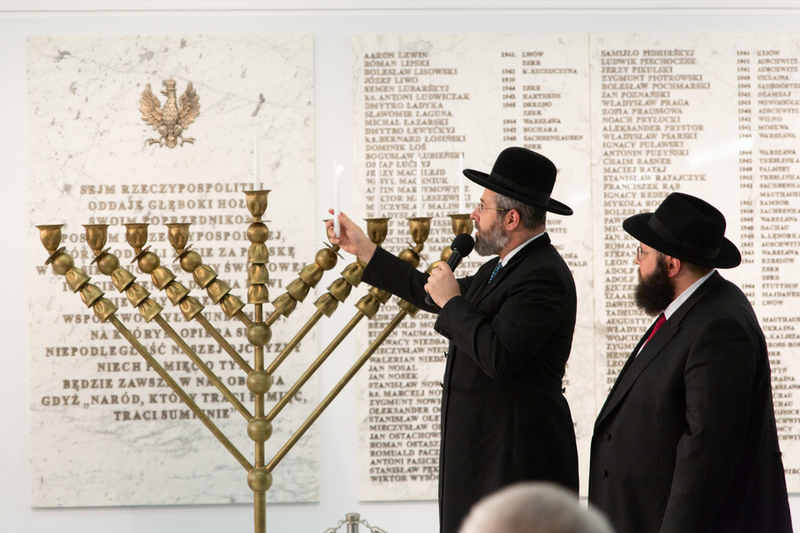 WARSAW, POLAND, December 06, 2018 /24-7PressRelease/ — In a stirring ceremony attended by senior Polish government officials and Israeli dignitaries, Hanukkah candles were lit in the Polish Sejm (Parliament) tonight. Gracing the event were senior government officials including Deputy Prime Minister Piotr Gliński; Chairman of Law and Justice Party Jarosław Kaczyński; and Parliament Chairman Marek Kuchcińsk, along with Chief Rabbi of Israel Rabbi David Lau; Chabad Rabbi of Warsaw Shalom Dov Ber Stambler and a large delegation from Israel. Lau’s father and predecessor former Chief Rabbi Yisrael Meir Lau was born in June 1937 in Piotrków Trybunalski in south Poland, a scion of an unbroken chain of 38 generations of famous rabbis. The senior Lau’s father and brother were deported along with the majority of Jews in their Polish town to the Treblinka extermination camp in 1942, where they all perished, while he, his mother and another brother managed to escape. In November 1944, they were rounded up again, and this time, he was separated from his mother and imprisoned in the Nazi slave labor camp in Częstochowa at the age of seven. From there, they were deported to the Buchenwald extermination camp. Lau attributes his miraculous survival to the heroic efforts of his older brother Naftali, as well as a Russian teen by the name of Fedor Mikhailichenko who took the boy under his wing and saved his life. “It is extremely meaningful to be lighting the menorah here in Warsaw, on the soil where the Nazis tried to exterminate us all,” he concluded emotionally. The Jewish Festival of Lights is being celebrated in a variety of locales and frameworks throughout the eight-day holiday. The highlight is a gala Hanukkah extravaganza in the Jewish Museum of Warsaw that will be attended by some 500 community members and feature Israeli performing artist and musician Dudu Fischer.